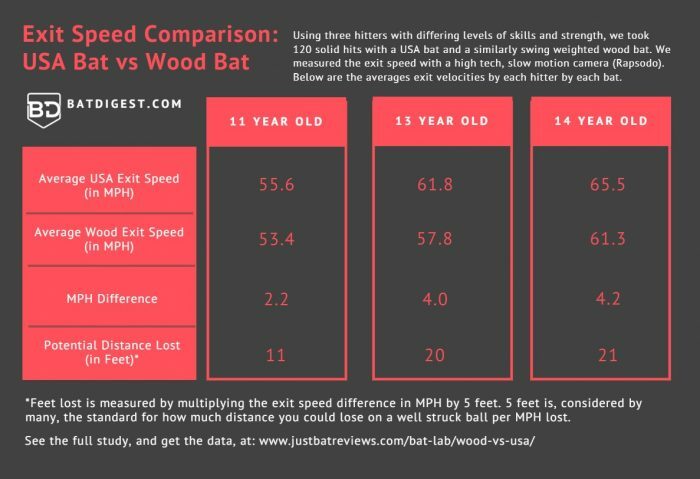 We’ve been asked more than a few times to compare the exit speeds of USA Bats and wood bats. We took up the challenge. Three different hitters of differing ability took over 300 swings with two competing bats. We measured the exit speeds on our Rapsodo device. 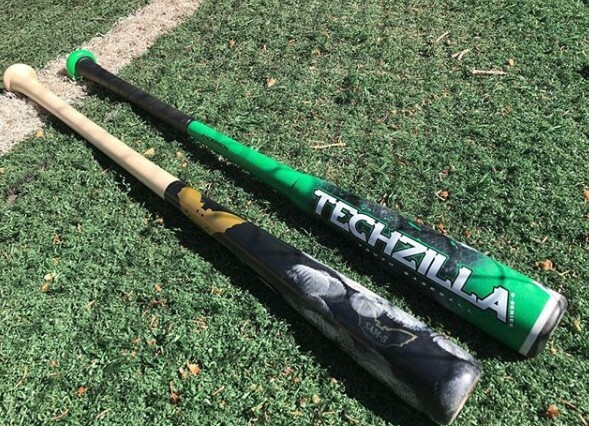 Then, we compared to the 2019 Techzilla S-Series USA Bat and a pure maple Sam Bat MC-5 exit speeds. Note, too, we controlled for the bat’s swing weight and gathered enough information to make a determination on exit speeds across the board for age categories. In short, the USA composite Techzilla S-Series outperformed in exit speeds the wood bat among each of out hitters. For the 11 year old it was 2.2 mph better, the 13 year old was 4.0 mph and the 14 year old was 4.2 mph better. This results in, on a well struck ball, a difference of 11, 20 and 21 feet respectively. Feedback from the player’s mirrored the results. They liked how the composite bat felt when compared to the wood bat. And, although some wood bat hits felt amazing, the S-Series was more useable. We even found the youngest hitter shying away from hard swings with the wood bat due to hand sting. Another reasonable concern for wood bats is their durability. We’ve found that most of our wood bats, especially the youth ones, stay intact quite well. Rarely are the players swinging hard enough or see the top end pitch speed/sliders that can break a bat. But, they are less durable than composite and aluminum bats. Not that those bats have never broke, but the vast majority of aluminum and composite bats have at least 12 month warranty. We have yet to see a wood bat with a warranty over 90 days. We tried our best to control for swing weight. Swing weight is a considerable factor in measuring ball exit speeds. Bats with a higher swing weight (all things, like swing speed, held constant) will hit the ball further than their counterparts. Controlling for bats swing weight (i.e. making sure they have the same swing weight) is paramount in documenting useful data. But, wood bats swing considerably heavier than their aluminum and composite counterparts. Getting an apples to apples comparison in exit speeds is therefore difficult. This heavy swing, in large measure, is why most parents and players remove wood as an option from the start. We did find a reasonable swing weight match in our inventory—although the wood bat still swings 8% heavier. A 30/25 Sam bat and a 30/21 Techzilla S-Series have a swing weight difference of 6.5%. The MOI of the Sam Bat Drop 5 in a 30 was 6200 and the drop 9 Techzilla is 5800. Are Wood Bats Never a Good Idea? We think players who want to be great hitters should get a wood bat as early as possible. Wood bats build strength and force players to find the center of the barrel. Both great things to work on while doing batting practice, cage and tee work. We could even see an at bat or two that makes sense with a wood bat for a particular USA player. But, when the game is on the line and your at bat matters the right answer, nearly all the time, is an aluminum or composite USA Bat. We have a Rapsodo and did a similar experiment for my 11 year olds 5th grade science project. We compared the exit velocities of 6 USA Bats vs 6 Wood bats. We hit off of a tee though to keep that aspect of the experiment the same for all bats. One of the bats we used in the comparison was the Rawlings 5150, it had the 3rd best exit velocity average of the USA Bat’s. We have found the 5150 to be a solid inexpensive bat, we have had many kids on our LL team use it most of the season and do very well with it. For each bat we took 30 swings total and dropped the top two and bottom two results for each bat (to potentially eliminate any miss reads or anomalies at both ends) so the results are of the averages of the 26 remaining swings. My son got very similar results with both USA Bats and Wood Bats and in practice BP and in game AB’s he seems to hit both the same. He’s been using the Chandler bat most of the season. Good work and good job. Fun data set. Our experience has shown that tee work benefits small sweet spots and high MOIs. When a player doesn’t need to focus so much on the finding the ball as they do swinging hard then high MOI and small sweet spot bats will perform better in exit speed tests. High MOI and small sweet spot bats are very wood-like characteristics. As well, doubling the collision impact with an incoming pitch changes results too. We’d guess that explains at least some of the difference between your results and ours. But it is just a guess. Hard to tell, though, without further explanation and a lab. And, as we say in the video, elite hitters don’t need big sweet spots. They need MOI. Which is what wood bats give them. The one thing I’d like to see different is using a mid-range USA bat. Maybe 5150, S750, Prodigy or something like that. The issue for most folks having to use USA bats is cost.